PlayStation 3’s v3.10 firmware update is arriving today — just a day after Microsoft got its social services integrations online — and it brings with it the ability to add certain information, like Trophy updates, to the user’s Facebook feed. 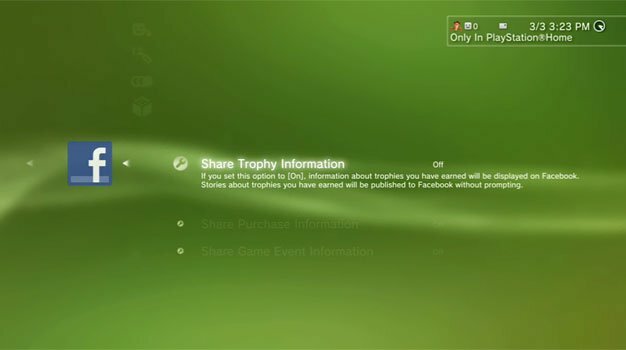 Lempel adds that the addition of Facebook to the XMB is just “phase one” of the company’s bigger plans to add social networking functionality to the system, the end game being a “communication feedback loop” where, for example, users can comment on each other’s Trophy unlocks. Sony’s also looking into other social networking sites like Raptr, Lempel says. The v3.10 update brings changes to photo organization and the presentation of the friends list as well, and should be available now.